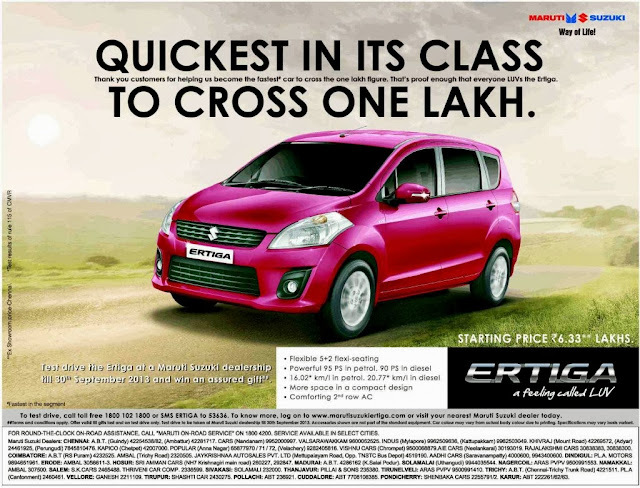 Maruti Suzuki, India's largest car maker opened a new segment by launching Ertiga in India. The car became so famous that it created a record sales of 100,000 units in domestic market within just 17 months. As on August 31 2013, Maruti has sold a total of 101,041 units of the Ertiga in India. The company claims that within this segment, Ertiga is first one to cross 100,000 units in such a short time. Nevertheless, there is hardly any competition in this segment as of now - Chevrolet Enjoy was launched much later could be called as its direct competitor. Now with the launch of Honda Mobilio, next year, lets see how fast they achieve this target. The Ertiga continues to be a sales success not only in India, but also in Indonesia. It accounts for about 40% of Suzuki’s sales in Indonesia and even Mazda sells a re-badged version of the Ertiga called the VX-1. More details on Ertiga could be checked here.